In August 1993, Nā Maka o ka ‘Āina spent twelve days capturing on video the proceedings Ka Ho‘okolokolonui Kānaka Maoli — Peoples' International Tribunal Hawai‘i, 1993, in which the United States and the state of Hawai‘i were put on trial for crimes against the original people of Hawai‘i, the Kānaka Maoli. A panel of international judges was convened to hear the charges, which included genocide, ethnocide, the taking of our sovereign government and the destruction of our environment. During those days of testimony, the Tribunal traveled to five islands to see and hear firsthand the words and personal experiences of witnesses, many of whom faced arrest and eviction from native lands. The Tribunal judges and prosecutor/advocates from Japan, Aotearoa (New Zealand), Jordan, Korea, Africa, the U.S., Puerto Rico and the Cree, Cherokee, Shawnee and Creek nations brought to the proceedings a familiarity with the changing dynamics of international law regarding indigenous peoples. At the end of ten days, the Tribunal called upon the United States and the world to recognize the fact that our sovereignty has never been extinguished. It also called for the restoration and return of all lands to which Kānaka Maoli have a claim. Spoken testimony is supplemented visually with graphics, political cartoons, archival photos and film, aerial shots and contemporary footage of land occupations and struggles. Music by Kalani Kahalepauole, Jon Osorio, Stephen Brown, Henry Kapono, Ilona Moritsugu, Liko Martin, Helen "Didi" Lee Kwai. Produced in cooperation with Ka Ho‘okolokolonui Kānaka Maoli — Peoples' International Tribunal Hawai‘i 1993, Dr. Kekuni Blaisdell, Convener. Partial funding from Hui Na‘auao, Pacific Islanders in Communication, United Church Board for World Ministries. Asian American Film Festival • Washington, D.C.
"The Tribunal is by award-winning video makers Puhipau and Joan Lander. 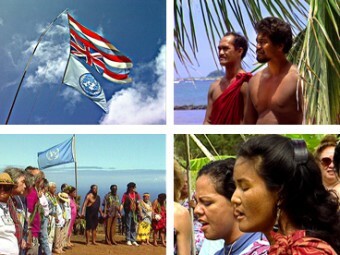 They have devoted their lives to chronicling the plight of Native Hawaiians. The Tribunal is a strong addition to their growing body of documentary and advocacy work. The story needs to be told."